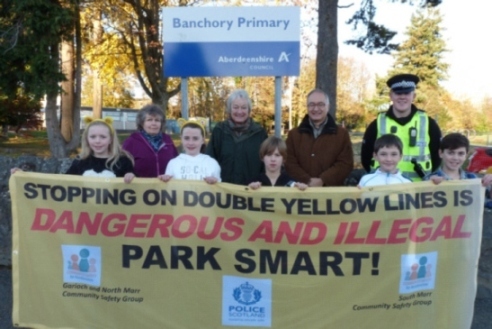 The South Marr and Garioch & North Marr Community Safety Groups have provided funding to produce four banners to highlight parking on yellow lines and zig zag markings outside schools in the Marr area. The banners were displayed at the launch of the initiative at Banchory Primary School. They will be used at schools throughout the Marr area where issues have been identified during school drop-off and pick-up times. "Along with the Garioch and North Marr Group we welcome the opportunity to help improve safety at our schools. "We live in a time when more and more pupils are transported to school in the family car so safety is paramount." "Police are committed to keeping children safe and my concern is that pupils could be hurt as a consequence of the minority of drivers who choose to park dangerously. "I would remind those who do the school run not to obstruct driveways, and do not park on yellow lines or zig zag lines next to schools."